Next time you're stuck in the construction traffic on Mayfield between Lee and south Taylor Roads, take a good look at the U-Haul building. 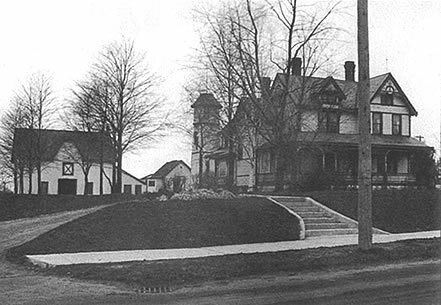 Did you know that this building was once a thriving dairy, right here in Cleveland Heights? Orville A. Dean founded Dean's Dairy on this spot in 1884. At 35 years old, Orville first started selling milk to friends and acquaintances. In 1886, he built a large farmhouse, which served as his family home, the dairy and the office for the company for seventy-one years. 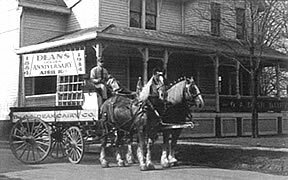 In the early years, milk was delivered by horse-drawn wagons. The delivery men dipped large ladles into the 10 gallon cans, and then poured the milk into each housewife's pitcher. 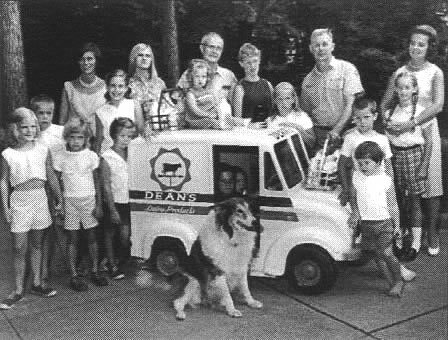 Dean's Dairy was know for its prize-winning Blue Ribbon thoroughbred horses, which were housed in its stables. In 1920, Harry N. Dean took over the company from his father. By then, Dean's had grown to eight retail outlets and one wholesale store, with new machinery and equipment. During these years, the Dean's Dairy's many fine horses were displayed at shows and fairs throughout the area. 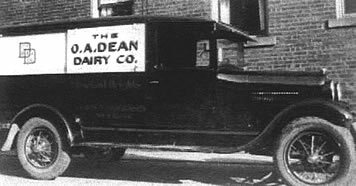 The war years were difficult, with food rationing and drivers leaving for the front, but luckily for Dean's, dairy products remained in demand. Grove P. Dean, grandson of Orville, originally moved east to try his hand in other businesses, but was drawn back to home. Under his guidance, Dean's converted most of the wagons from horse drawn to automotive, although some horses were still used. Rubber tires were added to these "very modern units" to cut down on noise during early morning deliveries. Original site of the O.A. Dean Farm and Dairy on Mayfield Road near Ivydale, ca. 1916. Wilburt McCarthy, who retired in 1975 after 40 years as a Dean's milkman, remembered delivering "to the home every day then, seven days a week. We'd go out and load up the wagons at two or three o'clock in the morning and we'd put in our 10 to 12-hour work day. The pay wasn't much for a milkman." Old Golden Guernsey milk truck. "Dean's had the best chocolate milk, barring anyplace," remembered milkman McCarty. "It was really out of this world. In the summertime, we serviced a lot of house painters. And we'd sell off the truck to those fellows all the time, buttermilk and chocolate milk." Dean's milk was "one of nature's most important foods" and most "every person can benefit in well being and energy with a daily intake of one quart of milk." Even Dean's buttermilk was "slimming and satisfying." In their 75th anniversary brochure, the company explained the improvements in quality control. "The laboratory in the modern dairy plant is an integral part of its operations. Among its various functions is the testing of milk for butterfat percentage. Testing both chemically and bacteriologically is done on the farmer's raw supply and on the finished product. In addition, analyses are made of new and present products for continued improvement . . . Raw milk specimens are subjected to microscopic examination for conformation to Dean's rigid quality control standards." "We're celebrating Dean's 75 anniversary." dropped. He also worked as a weekend night watchman, listening to Casey Kasem's Top 40 on the radio. His favorite memories of working at Dean's were the wonderful stories the drivers shared with him. "The drivers were very kind to me," Kelly remembered, "and they encouraged me to stay in school and go on to college." Dean's was "a great place to work," although going from the hot summer weather outside to the cold air of the cooler could be a shock. Two other dairy companies operated in Cleveland Heights as well. Hillside was started in 1932 and located on Center Road, near Noble and Mayfield. Many people remember the wonderful tours of Hillside Dairy and their delicious lunch counter. Hillside is also remembered for having one of the first female milk drivers. 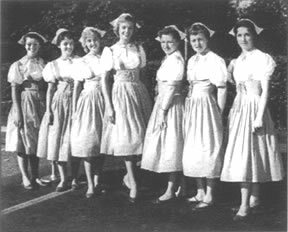 In one month, they had 18 drivers called up for service in World War II, so they hired the "first feminine milk-carrier, six feet, 170 pounds." Bruder's dairy opened in the early 1900s. One of Bruder's busiest retail stores was located in what is now Seitz-Agin Hardware. 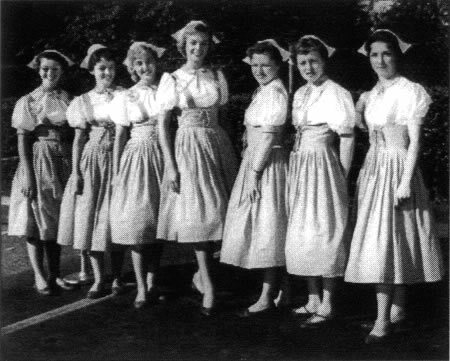 Families celebrate Dean's 75th Anniversary in 1959. Innovations in refrigeration and the proliferation of convenience stores and supermarkets in the 1970s signaled the end of small dairies that specialized in home delivery. People no longer wanted the more expensive, home-delivered milk products. However, many Cleveland Heights residents have fond memories of the milk truck making their regular deliveries throughout our community.